A solution’s maximum concentration is the reagent’s solubility limit (saturation) at a given temperature (see chemistry and reagents). For most soluble reagents, there is a direct connection between solution concentration and density, resulting in control simplicity. Sodium chloride is used as an ion exchanger regenerator (softening, removing nitrates from drinking water). Figure 6 provides an example of the brine preparation unit applicable to a major plant. Feeding is carried out from a separate tank containing brine at a fixed concentration level, usually close to saturation point. A densimeter is used to check the solution (see characteristics solution constants). A protective lining must be applied to concrete sumps. 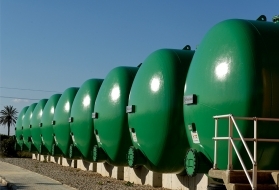 The use of steel (whether carbon or stainless) is prohibited for any part that is in contact with the brine. Plastics and vulcanised steel are routinely used. The crystallised product is usually dissolved to produce concentrations of between 100 and 200 g · L–1, checked with a densimeter (see section characteristics solution constants). 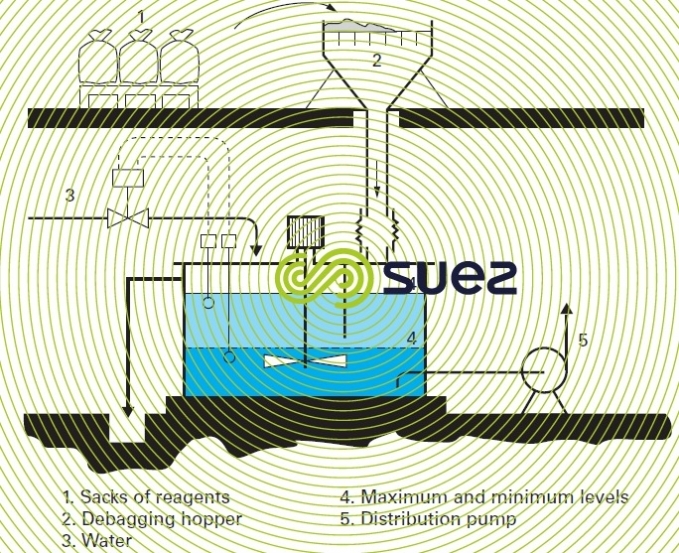 A solution prepared by dissolving 25 or 40 kg sacks in a mixing tank operating between two levels (prepared by the tank load) (figure 7). A solution is prepared in a constant level (continuous) mixing tank, using powder taken from a storage silo (figure 8). In this case, the powder is dispensed dry by volumetric feeders (revolving disk, screw or rotary vane feeder) or, when greater accuracy is required, by gravimetric feeders. The devices described by figures 7 and 8 are also used for slaked lime. 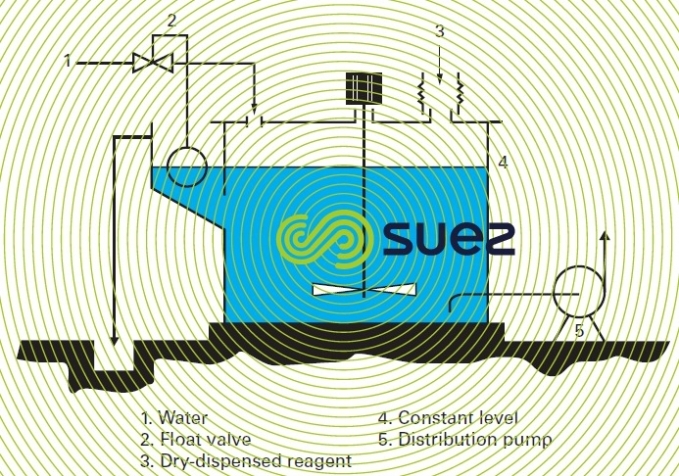 When using products that contain high levels of impurities, the dissolving device shown in figure 9 is preferred. Aqueous solutions of aluminium sulphate are acidic and this must be taken into account when selecting storage and dispensing equipment (plastics and stainless steel 316 or 316L). The solid product releases dust that is a nose and throat irritant. In its solid or liquid form, it is used as a coagulant. The liquid form is recommended and, in fact, the most frequently used. The crystallised product (FeCℓ3, 6H2O) is supplied as brown or red shards that tend to agglomerate and melt in their crystallisation water. 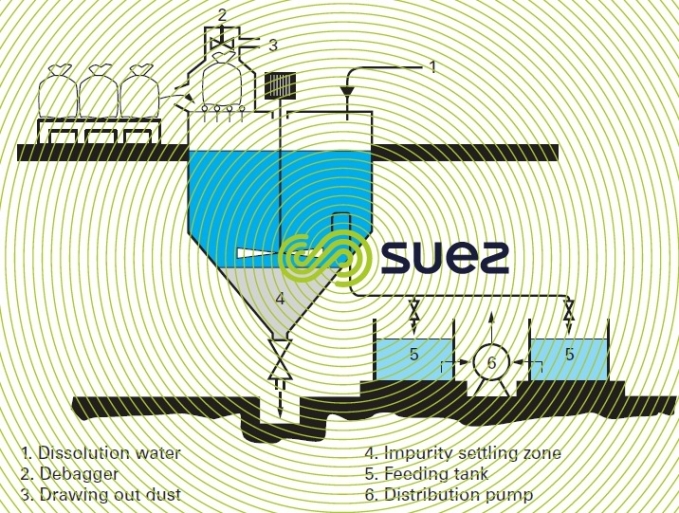 When a solution is prepared, the mixing tank needs to be cleared of insoluble impurities that are very often found in the commercial product (figure 9). Feeding is carried out using a solution prepared at a constant concentration (e.g. 100 to 200 g·L–1 of FeCℓ 3), monitored by a densimeter (see section characteristics solution constants). Ferric chloride in blocks can also be used to prepare a solution using a system such as the one shown in figure 6 for brine. Aqueous solutions of ferric chloride will attack carbon steel or stainless steel and almost all metals. Tanks and circuits must be selected and protected accordingly (plastics and vulcanised steel).